Egon Matijevic's 90th Birthday Party - "You'll Be in My Heart"
Egon Matijevic's 90th Birthday Celebration - "For the Longest Time"
POTSDAM - Egon Matijević, Professor of Colloid and Surface Science and Distinguished University Professor at Clarkson University, will be honored with a special symposium at the fall American Chemical Society (ACS) national meeting in Philadelphia, Pa., next week. The symposium, "Half a Century of Fine Particles Science: A Symposium in Honor of Egon Matijević at 90," is being held under the auspices of the ACS Division of Colloid and Surface Chemistry. Renowned among Clarkson alumni as a maestro in the lecture hall and among his peers world-wide for his scientific virtuosity, Matijević's is a world-renowned scientist with numerous patents and innovations to his name. "Clarkson University has had the honor and great fortune to serve as the home of Professor Egon Matijevic and his scientific research for 55 years," said Clarkson University President Tony Collins. "Dr. Matijević's discoveries and international reputation in colloid and surface chemistry have brought great recognition to our university, while at the same time he has shared his great knowledge with thousands of our students. It is befitting for Dr. Matijević to receive the honor of this recognition by the American Chemical Society." The symposium is being organized by Matijević's colleagues, friends and mentees -- professors S. V. Babu, Dan V. Goia, Sergiy Minko, and Richard E. Partch of Clarkson University, and Leszek Hozer of the Dow Chemical Company. Matijević, who celebrated his 90th birthday in April, is active as a full-time member of the Department of Chemistry and Biomolecular Science at Clarkson. Matijević began his career at Clarkson in 1957 as a post-doctoral fellow. 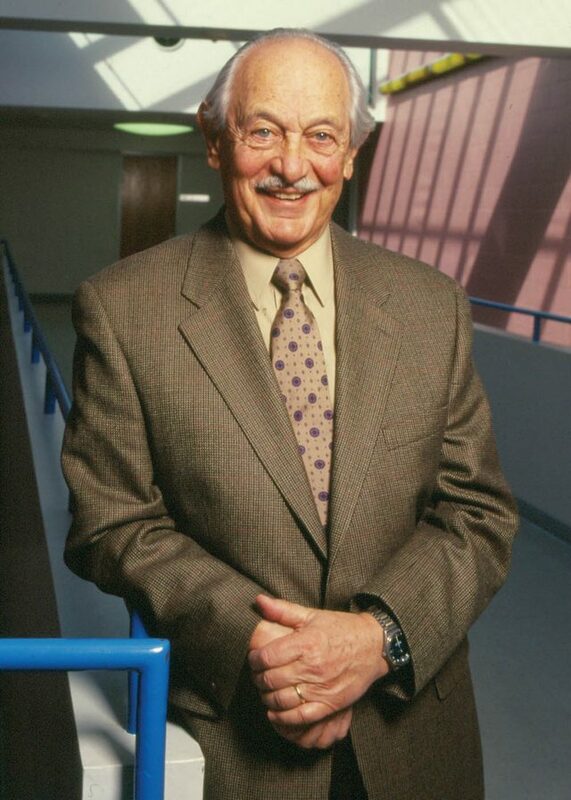 In 1965, he established the Institute of Colloid and Surface Science, the first of its kind in the U.S. He has received many honors nationally and internationally and is the only individual to receive all three major awards of the American Chemical Society in his field of colloid chemistry: The Kendall Award (1972), the Langmuir Distinguished Lecturer Award (1985), and the Ralph K. Iler Award (1993). He was also honored with the Thomas-Graham Award in 1985, the highest prize of the oldest colloid society in the world, Germany's Kolloid Gesellschaft. As a mentor, Matijević has instructed 15,000 undergraduate students and advised more than 50 Ph.D. candidates, 50 M.S. students, and 130 postdoctoral scholars. Matijević has delivered more than 70 plenary and keynote lectures at meetings and symposia in dozens of countries worldwide. He has received honorary degrees at universities worldwide, including Lehigh University, Maria Curie-Sklodowska University, the University of Zagreb, the National University of San Martin, the University of Ljubljana, and Clarkson University. Matijević's research focuses on synthesizing minute particles with precise shapes, sizes and composition, and studying their properties. Through his synthesis techniques, he can create particles that meet specific requirements, and the effects of his groundbreaking research are far reaching. His research interests include colloid stability, interactions of colloids with complex solutes, adsorption from solutions, inorganic precipitations, monodispersed inorganic and polymer colloids, particle adhesion, colloid aspects of ceramics, interfacial aspects of corrosion, aerosols, medical diagnostics of fine particles, nanostructures, chemical mechanical polishing, and many other research areas. Most recently, Matijević has been focused on developing uniform drug particles. There is ample evidence that the effects of drugs depend not only on their chemical composition, but also on the physical state of the delivered medication. The latter condition is affected by the shape and size of the drug particle, which he has been able to control. This year''s celebrity Egon Matijević was born in the Croatian village of Otočac ninety years ago. He was educated in Croatia where he started his extraordinary scientific carrier. After postdoctoral studies in England Matijević moved to USA where he joined Clarkson College of Technology (present Clarkson University) at Potsdam (NY). Egon stayed with Clarkson contributing significantly to the University especially within the Department of Chemistry both in teaching and in research in the field of colloid chemistry. As a colloid chemist Egon was involved in examining physicochemical properties of colloids and interfaces, in several aspects of application and especially in developing new methods of preparation of well defined uniform particles. At present his main focus lies in the application of colloidal systems in medicine. Egon Matijević is a prominent scientist and his achievements were recognized by the scientific community world wide being the recipient of numerous prestigious awards. Dedicated to Professor Egon Matijević on the occasion of his 90th birthday. This year’s celebrity Egon Matijević was born ninety years ago in the Croatian town of Otočac. He was educated in Croatia, where he started his extraordinary scientific career. After postdoctoral studies in England, Matijević moved to the USA, where he joined Clarkson College of Technology (presently Clarkson University) in Potsdam, N.Y. Egon has stayed with Clarkson contributing significantly to the University, especially within the Department of Chemistry both in teaching and in research in the field of colloid chemistry. As a colloid chemist Egon was involved in examining physicochemical properties of colloids and interfaces, in several aspects of application and especially in the development of new methods for the preparation of well defined uniform particles. At present, his main focus lies in the application of colloidal systems in medicine. Egon Matijević is a prominent scientist and his achievements have been recognized by the scientific community worldwide, being the recipient of numerous prestigious awards. The enthusiasm and spirit of Egon Matijević is exceptional and we wish him to continue enjoying science and the art of living for many years to come. 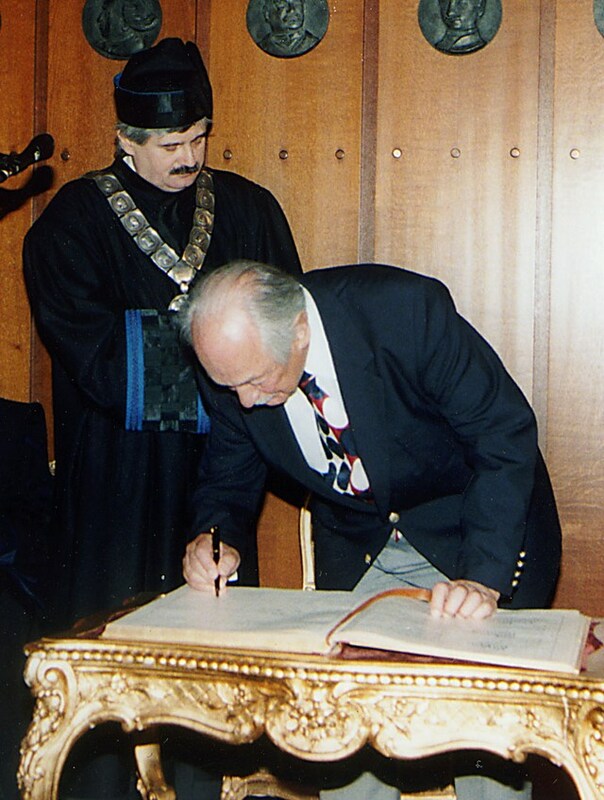 Professor Egon Matijević in 1998, during the ceremony of receiving the degree of Doctor Honoris Causa from the University of Zagreb. On the left Professor Branko Jeren, the then Rector of the University of Zagreb. during the ceremony of receving the degree of Doctor Honoris Causa in 1998. Egon Matijevic, the Victor K. LeMer Professor of Colloid and Surface Science at Clarkson, is an internationally celebrated colloid chemist and academic. The University hosted a series of receptions throughout the country in 2007 to allow Matijevic's friends, colleagues and former students the opportunity to celebrate his 50 year milestone as a teacher, scientist and mentor. The 86-year-old professor held even non-scientists spellbound as he demonstrated to the audience just how beneficial, beautiful and sometimes deadly the microscopic particles that are all around us can be. His presentation was titled "The Good, Bad and Ugly." Before presenting Matijevic with the proclamation of his appointment from the board of directors, Marlinda LaValley, hospital vice president of administrative services, read a letter signed jointly by David B. Acker, the hospital's president and CEO and Edward S. Mucenski, board chairman, thanking him for his many decades of pioneering research in colloid chemistry, community involvement and support of the hospital. Both Acker and Mucenski were unavoidably out of town on hospital business. Dr. Alexandru Stoian, a cardiologist, referred to Matijevic as a great man and shared some of the highlights of a career that has spanned more than five decades. 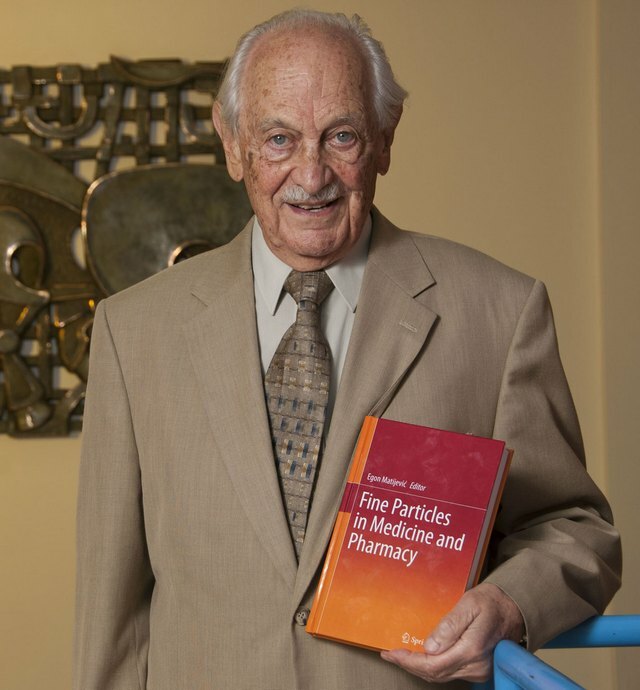 He had a copy of Matijevic's resume with him when he went to the podium to speak and said, "You can point to any decade since the 1950s and find groundbreaking accomplishments in colloid science and chemistry pioneered by Matijevic. Earlier in the evening Matijevic quipped that his friend's job was to keep his heart going, while his job was to was to teach Dr. Stoian about wine. Dr. George Mina, an orthopedic surgeon, offered that Matijevic was not only a world-class scientist, but a pretty fair cook. He related how Matijevic took over the food preparation on a couple of occasions to save the evening, even though the get togethers weren't even at his home. Matijevic was born and educated in Croatia. 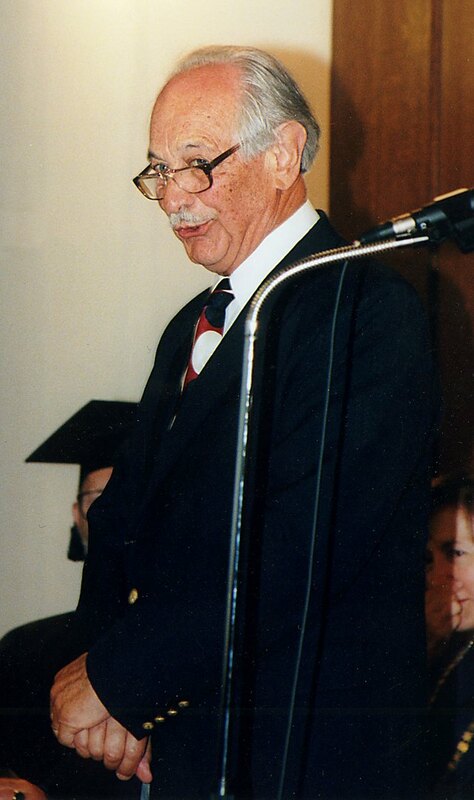 He began his teaching career at Clarkson in 1957. 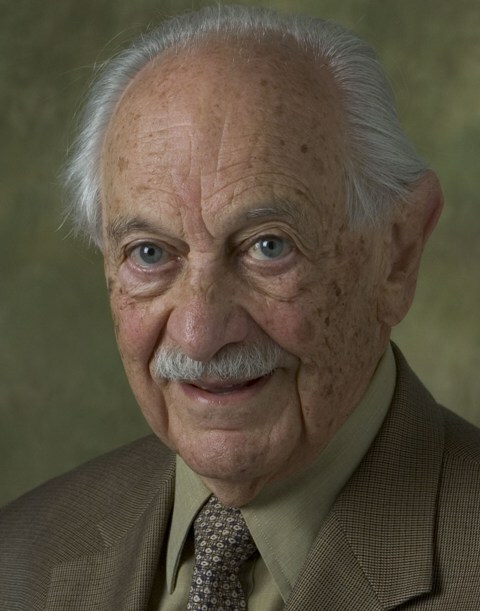 In addition to numerous Honorary Ph.D.s and citations, he is the only individual to receive all three major awards of the American Chemical Society in his field of Colloid Chemistry. Matijevic is also the recipient of the Graham Award, the highest prize bestowed by the oldest colloid society in the world. This is the first time Canton-Potsdam Hospital has made an Honorary Distinguished Academic Appointment to their Medical Staff. He served also as a member of Advisory Board of various international journals. (Croatica Chimica Acta, Chemistry of Materials, Colloid Journal of the Russian Academy of Sciences, Colloids and Surfaces, Langmuir, Colloid and Polymer Science, Journal of Colloid and Interface Science). During the period 1983-1989 Professor Matijevi6 served as the President of the International Association of Colloid and Interface Scientists. On the list of the Ph. D. theses supervised by Professor Matijevi6 are 50 names, including Francis I. Mangravite who was the prize winner in 1972 - for the best Ph. D. thesis, selected by the American Water W orl(s Association. Egon Matijević is the only scientist to receive all three awards of American Chemical Society (The Kendall, Iler, and Langmuir Lectureship). He is also the recipient of the Thomas Graham Prize, the highest recognition by the German Kolloid-Gesellschaft. Throughout his carrer Professor Matijević has been a devoted teacher. Indeed, he taught the general chemistry course to generations of Clarkson freshmen. It is being said that one half of all living Clarkson alumini attended his classes! Colloid stability; interactions of colloids with complex solutes; adsorption from solutions; inorganic precipitations; monodispersed inorganic and polymer colloids; particle adhesion; colloid aspects of ceramics; interfacial aspects of corrosion; aerosols; medical applications of fine particles; pigments; nanostructures, chemical mechanical polishing. E. Matijević: Nanosize Precursors as Building Blocks for Monodispersed Colloids. Colloid Journal, 69, 29-38 (2007). A. Zelenev and E. Matijević: Surfactant-induced Detachment of Monodispersed Hematite Particles Adhered on Glass. J. Colloid Interface Sci., 299, 22-27 (2006). Z. Lu, N.P. Ryde, S.V. Babu and E. Matijević: Particle Adhesion Studies Relevant to Chemical Mechanical Polishing. V.K.R. Gorantla, E. Matijević and S.V. Babu: Amino Acids as Complexing Agents in Chemical Mechanical Planarization of Copper. Chem. Mater., 17, 2076-2080 (2005). S. Škapin and E. Matijević: Preparation and Coating of Finely Dispersed Drugs. Loratadine and Danazol. S. Libert, D. Goia, and E. Matijević: Internally Composite Uniform Colloidal Cadmium Sulfide Particles. I. ul Haq, I. Fraser, and E. Matijević: Preparation and Characterization of Finely Dispersed Pigment Particles. Colloid Polym. Sci., 281, 542-549 (2003). I. Sondi, and E. Matijević: Homogeneous Precipitation by Enzyme Catalyzed Reactions. II. Strontium and Barium Carbonates. Chem. Mater., 15, 1322-1326 (2003). M. Bele, O. Siiman and E. Matijević: Preparation and Flow Cytometry of Uniform Silica-Fluorescent Dye Microspheres. J. Colloid Interface Sci., 254, 274-282 (2002). E. Matijević: A Critical Review of the Electrokinetics of Monodispersed Inorganic Colloids. In Interfacial Electrokinetics and Electrophoresis, A.V. Delgado, Ed., Marcel Dekker, NY, 2002, pp 199-218.
for her information about Professor Egon Matijević. D.Ž.